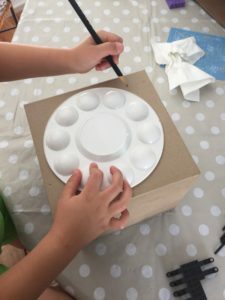 Loved our DIY take on The Very Hungry Caterpillar? While that one was on the more difficult side of DIY, this second costume in our series is, thankfully, a bit simpler. 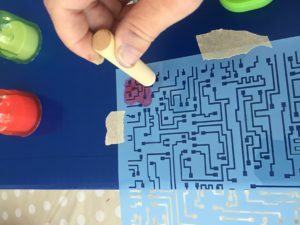 It's also cost effective, pretty easy, creative and — best of all — you can involve your crafty kid. 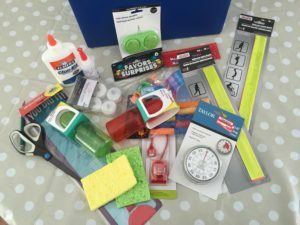 Your child will love picking out all the gadgets and choosing where to put everything. 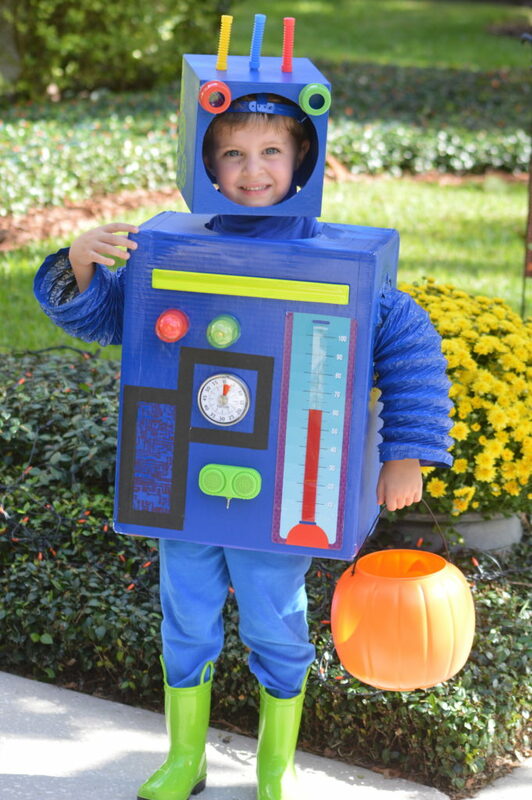 Plus, making this costume together will give you both a couple of fun, conversation-filled and technology-free afternoons together, all while getting a Halloween costume made. 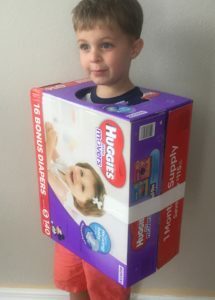 Find a box that will fit over your child. In this case, a bulk diaper box turned on its side work perfectly! 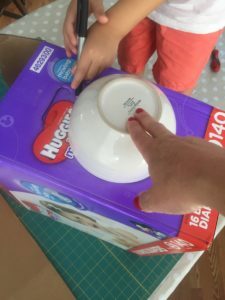 Turn box upright and use any circle shape to trace and cut out a hole that will fit over your child's head. 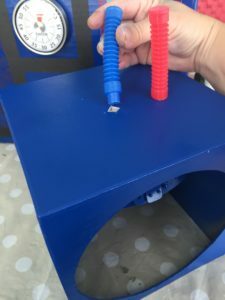 If the sides of your box are not completely solid, use a scrap piece of cardboard cut to the exact size of the sides and use duct tape to tape all around the edges to create a solid, complete box. 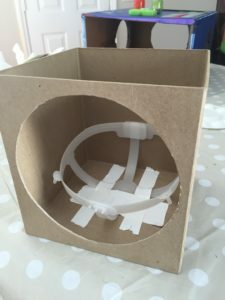 Use another circle smaller than the head circle to trace arm holes on each side cut through all layers of cardboard. Check for fit at this point before any spray paint is applied! Take box outside and spray all exterior sides with spray paint — go with multiple light coats for best coverage. Let the box dry completely. Gather all the robot accessories for the body. You can purchase tons of fun things at the dollar store. You can also use clipart printed from your computer and various household items (I used sponges for buttons). 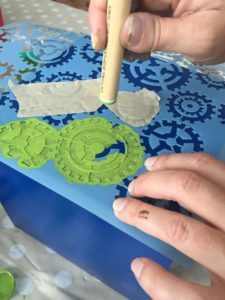 As another option, you can purchase stencils in the shape of gears and electric circuits. Place all your items and do a dry fit so you can see how everything looks together. 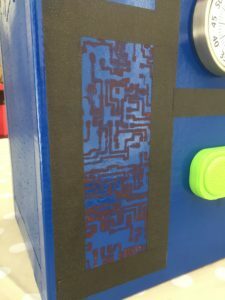 Perform any stencil work and let completely dry. Then, glue all the accessories and let dry again. 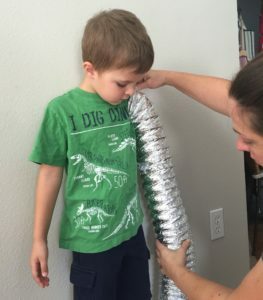 Place the foil vent over your child's arm to measure . 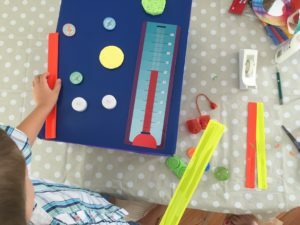 Measure the length to fall at wrist and then mark for where to cut to length. (You will need wire snips to cut the vent, so be sure to remove the vent from your little one's arm before cutting.) Cover the raw edges of both ends with masking or craft tape. 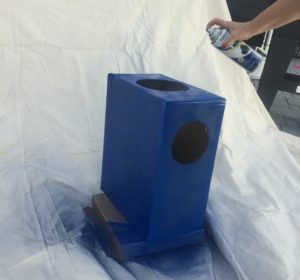 Spray paint both pieces of venting and allow to dry. Use duct tape, attach the vent arms to the armholes. The venting will probably be smaller than your arm hole, so the tape will be a flexible gusset between the venting and the box. 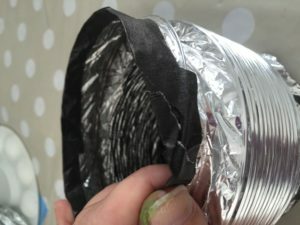 The duct tape should be placed on the inside as well as the outside. Work your way all around the entire arm hole. 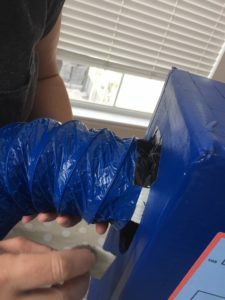 Once the arms are secured to the box, take it outside and spray paint the duct tape as well. You want everything to look seamless! Find a box that fits comfortably on your child's head. Trace and cut a circle on the front side that will allow for their face. 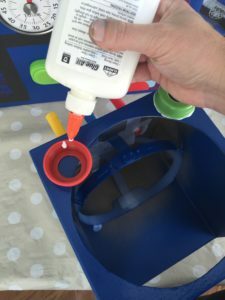 In our case, we needed something to secure the box to the child's head, so I used a plastic insert from a toy construction hat and duct taped it to the inside of the box. This allows him to rotate his head around and have the box stay put. 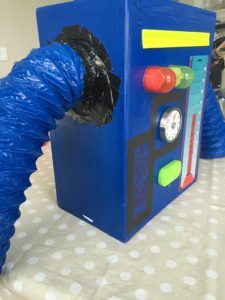 Take the box outside and spray paint all the sides using the same technique as you did for the body. 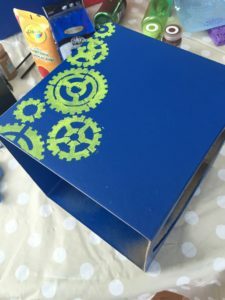 Once the box is completely dry, take inside and add your accessories, such as those gear-like stencils and clip art. The antennas on the top of the head are created from noise-makers. The eyes on the front are the bottle caps from the baby bottles used earlier on the body. Pair with a coordinating pair of solid leggings (or pants) and a pair of rain boots and you have a happy robot!